Zoom currently offers two products of this nature, the other being the H4 (£225) which has a different set of features. We picked the H2 to review for two reasons: first, it is the cheapest such product currently available, and second, it offers surround sound capability thanks to the inclusion of four internal microphones. Even if you don't want surround, the ability to choose between the front mics, angled 90 degrees apart, and the rear ones, angled 120 degrees, is useful. It's hard to deny that the price shows in the build quality - it's a bit plasticky. Even worse is the display, which is tiny and slow to respond, while the operating buttons are also minute and have very little tactile feedback. Combine those features with the lack of a 'stop' button and you have the recipe for an occasionally frustrating experience. It does all work, though, and is still a versatile little machine which can give satisfying results. The microphones were a little coloured-sounding on test. The mic amps are quiet, but still good. Performance via the line input is on a par with most rivals, but the headphone output is not keen on high playback levels and gets a bit harsh when listening loud. 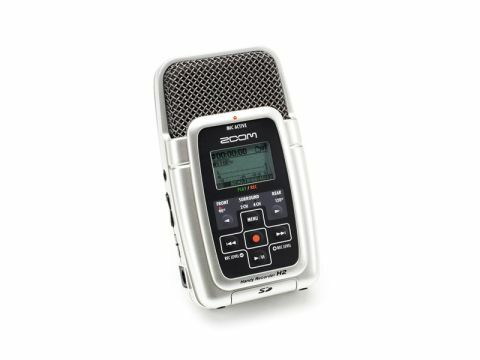 We probably wouldn't want to use this recorder very frequently - among other things its USB connection seems to be grindingly slow - but it is cheap, does the job, and is clearly fine for the very occasional recordist's adventures.